Laravel Eloquent Collection Tutorial With Example is today’s topic. The Eloquent collection object extends the Laravel base collection, so it naturally inherits the dozens of methods used to work with an underlying array of Eloquent models fluently. All multi-result sets returned by Eloquent are instances of an Illuminate\Database\Eloquent\Collection object, including results retrieved via the get method or accessed via a relationship. Laravel 5.8 Form Validation Tutorial With Example is today’s topic. Laravel Framework provides many different approaches to validate your application’s form data. By default, Laravel’s base controller class uses the ValidateRequests trait which provides the convenient method to validate incoming HTTP request with a variety of powerful validation rules. We can use the Validation differently in Laravel. We can either use inside the controller’s method or create a FormRequest class to validate the incoming requests. In this tutorial, we will all ways to validate Laravel. Laravel 5.8 CRUD Tutorial With Example For Beginners is today’s topic. You can upgrade your Laravel’s 5.8 version by going to this link. Laravel 5.8 continues the improvements made in Laravel 5.7 by introducing the following features. Laravel Stripe Payment Gateway Integration Tutorial With Example is today’s leading topic. We will use the Cashier package to integrate Stripe Payment Gateway in Laravel. The demand for Saas based platform is increasing day by day and nowadays building a subscription-based system is universal. So to make it easy on the backend like Laravel, we do need some packages that can help us build scalable, securable, and reliable web applications. Laravel Cashier makes it very simple to integrate Payment Gateway like Stripe. So let us see how we can integrate stripe in Laravel on Subscription based system. In this tutorial, we will see Laravel Cashier Braintree Payment Gateway Tutorial With Example We will build a Subscription based Platform in which the user can choose a plan, and according to that, he will be charged. We use Braintree for this demo, and we will discuss the stripe in the next tutorial. So, we will build a simple payment gateway in which a user can charge according to their selected plan. It is a straightforward system to work with, and for that, we need to create a developer account at Braintree. So, if you have not created yet, then please go to this link. How To Install October CMS on Mac is today’s leading topic. October CMS is built on Laravel Framework, the best existing PHP framework. Laravel framework includes all of the tools and classes that are necessary for making the quality websites and applications. OctoberCMS adds even more power to Laravel with the collection of simple and flexible features. Development with October can easily be adapted to any existing team workflow. Use your favorite version control system for storing and deploying website themes and plugins. You can build any websites or web apps with OctoberCMS from simple promotional sites to high load social networks. We will create a Single Page Application(SPA) using the Laravel and Vue.js. In this SPA, you can create a post, edit the post, read the post and delete the post. We will create Laravel API Backend. Laravel 5.7 Email Verification Tutorial Example From Scratch is today’s leading topic. In this version, you need to configure the settings and write some minimal code to setup everything. Email verification is the must functionality in web apps, and laravel makes very easy. So let us do it then. 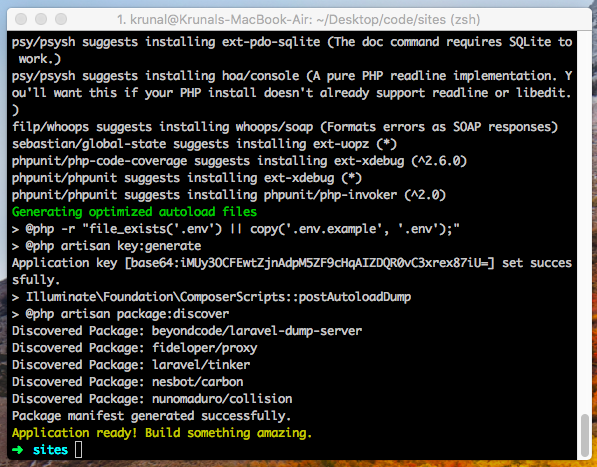 First, install the Laravel 5.7 using the following command. #1: Install Laravel 5.7 and configure the database. Fire up your favorite IDE or Editor. Laravel 5.7 CRUD Example Tutorial For Beginners From Scratch is today’s leading topic. Laravel 5.7 has some new cool features as well as several other enhancement and bug fixes. In previous Laracon event, Taylor Otwell announced some of the notable changes which are the following. Improved Error Messages For Dynamic Calls. Now in this tutorial, first we will install the Laravel 5.7 and then build a CRUD application.